Silver CardioChek PA can be purchased at a reduced price if old White CardioChek PA is mail back to us w/ payment NOTE: YOU MUST CALL us to order. 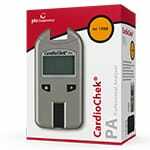 New Silver CardioChek PA will not ship until old White CardioChek PA is received by us. 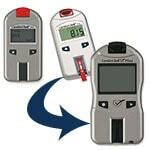 Customers with used whitle CardioChek PA devices are eligible for the upgrade program to the new silver CardioChek PA meters. The White CardioChek PA is no longer being manufactured. is part of the new CardioChek Connect Product Family line. 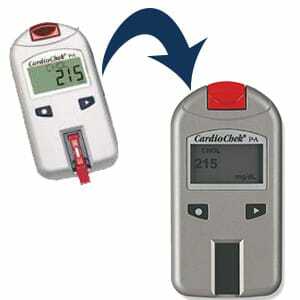 can be used with the CardioChek PA Printer. software upgrade including "temperature correction" function that calibrates test results for high or low operating temperatures. has a gray plastic mold with Silver Charcoal Metallic "Soft Touch" paint coating. 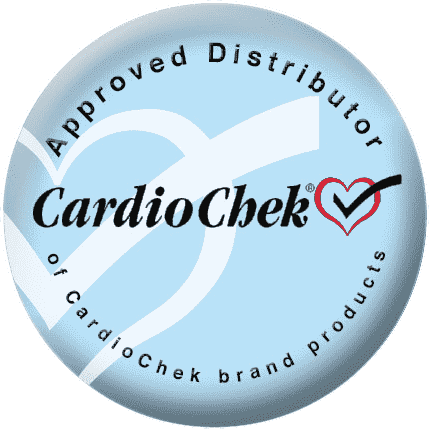 Please Click here for more information on the new features of the Silver CardioChek PA.
After placing the order online or by phone 888.595.3136888.445.0030, Test Medical will issue a Return Goods Authorization (RGA number). This RGA documentation will need to be sent with the used White CardioChek PA. Once Test Medical has received the used White CardioChek PA along with the correct paperwork within 30 days of the RGA, TMS will send out your new Silver CardioChek PA.